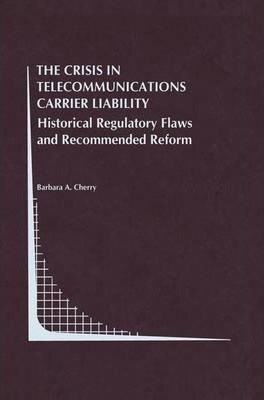 My curiosity with the economic efficiency and social benefits of provisions used by telecommunications carriers to limit their liability to customers for damages arising from service interruptions and network outages is a longstanding one. It began with the changing state regulatory environments in the late 1980's while representing AT&T as an attorney before numerous state legislatures in the Midwest. As telecommunications carriers faced the ramifications of deregulation, several legal consequences came to the fore. One important consequence was the impact of changing regulatory rules and requirements on the carriers' abilities to continue to limit their liability for damages to customers in a non-tariffed world. As a result, one of my responsibilities while employed by AT&T was to syek legislative relief in some state jurisdictions which would enable the continued use of limited liability provisions notwithstanding other deregulatory developments in the industry. In my capacity as an attorney, I succeeded in this task in the few jurisdictions for which I was given the charge.However, as an economist, these efforts piqued my interest regarding the economic effects of such limited liability provisions on consumer interests. What liability rules for the industry would really better serve general societal interests? As my career evolved, which involved returning to graduate school to pursue my Ph. D. and becoming the Director of Public Policy Studies at Ameritech, I had the opportunity to pursue interdisciplinary research in telecommunications policy issues.